In recent years, cultural institutions and commercial providers have created extensive digitised newspaper collections. 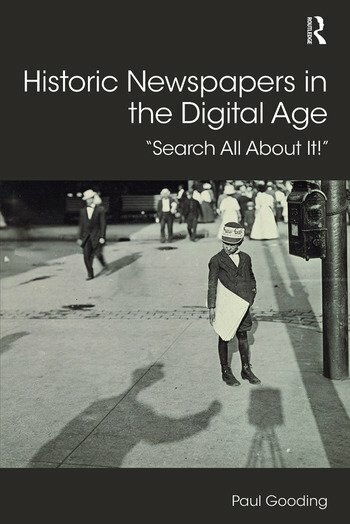 This book asks the timely question: what can the large-scale digitisation of newspapers tell us about the wider cultural phenomenon of mass digitisation? The unique form and materiality of newspapers, and their grounding in a particular time and place, provide challenges for researchers and digital resource creators alike. At the same time, the wider context in which digitisation of cultural heritage occurs shapes the impact of digital resources in ways which fall short of the grand ambitions of the wider theoretical discourse. Drawing on case studies from leading digitised newspaper collections, the book aims to provide a bridge between the theory and practice of how these digitised collections are being used. Beginning with an exploration of the hyperbolic nature of technological discourses, the author explores how web interfaces, funding models and the realities of contemporary user behaviour contrast with the hyperbolic discourse surrounding mass digitisation. This book will be of particular interest to those who want to investigate how user studies can inform our understanding of technological phenomena, including digital resource creators, information professionals, students and researchers in universities, libraries, museums and archives. Introduction: Search All About It! What Role do Libraries Have in an Age of Large-Scale Digitisation? Paul Gooding is Research Fellow in Digital Humanities in the School of Art, Media and American Studies at the University of East Anglia, UK.